A really useful product produced by squire. 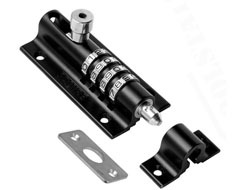 The combination door bolt uses a 10mm bolt surrounded by cast alloy and locked with a 4 digit combination which is easily reset to your own code. It can be locked in both the open and closed position. Ideal if you want to leave the door open and prevent anyone else from locking it. All necessary screws are included but you may require longer or shorter ones depending on where it is being fitted. These can be obtained from good hardware stores. The bolt can be fitted to a range of doors, warehouses, sheds and equipment boxes. 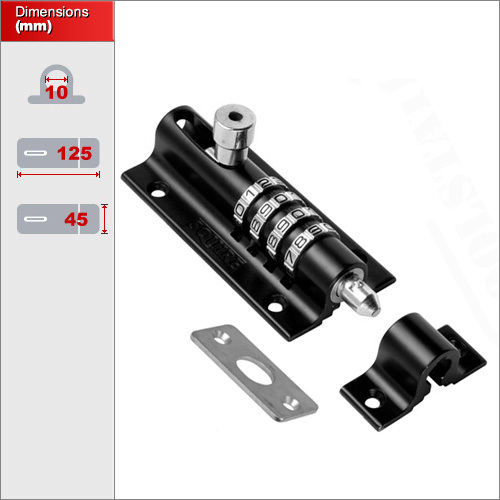 The strength of the unit means it can be used to secure a door shut without the need of a handled mechanism.